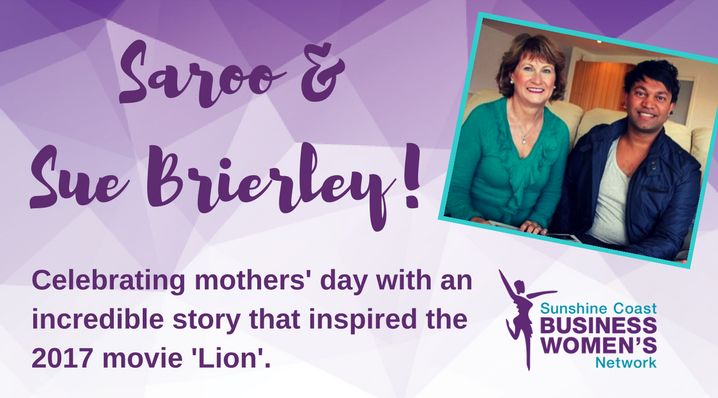 Join the Sunshine Coast Business Women’s Network as we celebrate Mothers’ Day with very special guests who were made known globally by the 2017 Oscar-nominated film ‘Lion’. Saroo and his adoptive mother Sue Brierley have an incredible story told in the best-selling autobiography A Long Way Home and later inspiring the film Lion starring Nicole Kidman and Dev Patel. We are so looking forward to welcoming them to our breakfast that will celebrate the incredible role that many of our members hold – the role of mother – whether it be birth mother, adoptive mother, step mother, guardian or care-giver. On 15th May we invite all who are mothers or have mothers (everyone!) to celebrate the amazing love, strength, guidance, wisdom and more that is shared by our beautiful mothers every day. Due to the event being only days away - we are unable to accept any further dietary requirements. Saroo was born in a small Indian town but at age 5 he lost all contact with his family after becoming separated from them at a train station. After living on the streets of Calcutta for 3 weeks by himself, Saroo was placed in a local orphanage and went on to be adopted by an Australian family. He grew up with his new parents – Sue and John Brierley – in Hobart, Tasmania where he spent the next 25 years. But he was unable, and unwilling, to forget the land of his childhood. Determined to rediscover his past he embarked on a virtual odyssey of his homeland and, after many hours pouring over Google Earth, armed only the images that were etched into his brain as a 5 year old, he managed to recognise his home town - and track down his mother. Saroo’s is a remarkable story of survival and sheer determination culminating in an intensely moving reuniting with his mother that made headlines across the world. Sue Brierley’s story is equally moving as she shares her experiences growing up as a child of Hungarian and Polish refugees with great difficulty, then deciding to change her mind-set and life completely seeing her choose a future of happiness. After marrying her husband John, they waited patiently for 16 years before adopting Saroo from India who brought amazing experiences into her life. 2 years later the family welcomed their 2nd son from India, Mantosh. With Saroo’s reuniting with his birth mother attracting global attention, Sue has embraced this as an opportunity to share her life and family choices with the world.